The Transponder may send and receive data to and from an external Control Unit placed on patient's skin. In addition, the Control Unit should be as inconspicuously as possible and the system may operate without patient intervention. As the Transponder is intended to be implanted, it should feature a long life time with the smallest size achievable. The implementation of all these challenging functionalities requires solving several important issues relating to communication, processing, packaging, and implantation site. To match these requirements and obtain all the desired implantable medical device features, an ultra-low power Transponder architecture has been designed to minimize the entire system power consumption, and consequently, to balance the trade-off between battery size and life time. Also, an optimal packaging solution is sought. The acoustic transducer, the battery and the electronic component volumes are balanced to maximize the acoustical performances in the smallest achievable volume. The platform is constituted of the external Control Unit and by the Transponder. The external Control Unit sends energy to the Transponder through ultrasonic waves. The electro-acoustic transducer of the Transponder transforms the ultrasonic wave in an electric AC signal that is transformed in a DC signal through the rectifier in order to recharge the micro-battery. The wireless data communication from the Transponder to the external Control Unit is achieved by using the load modulation technique, which is also called backscattering. The advantage of this technique is its low power consumption compared to classical transmitter as the carrier is generated in the Control Unit. The architecture of the Transponder is constituted of the ultrasonic data communication part, the power supply and energiser block, and of the interface to the sensor. The output of the sensor is connected to the input of the A/D converter in order to transform the analog signal in a digital one, which is stored in the FRAM memory. 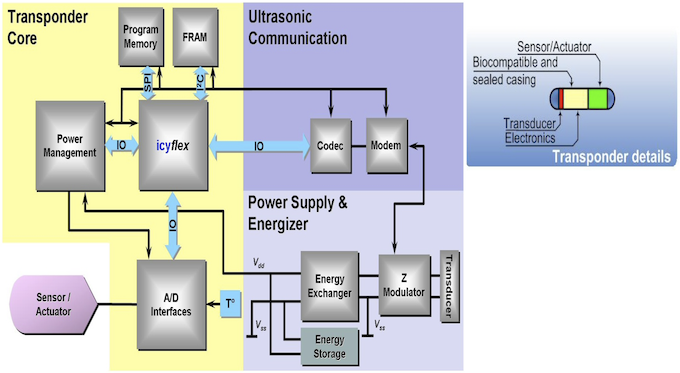 The Icyflex DSP/micro-controller treats the signal to perform different operations (e.g. compressed sensing). Then, the data modulates through the Modem the input impedance of the Transponder seen by the electro-acoustic transducer in order to perform backscattering operation. By this technique, the measurements of the sensor are sent to the external Control Unit. The incoming ultrasonic wave is transformed in a DC signal thanks to the energy exchanger (AC to DC converter, voltage regulator). Then, the energy is stored in the system. In the case of ULTRAsponder, the energy storage corresponds to the IPS rechargeable micro-battery. The impedance sensor consists of four electrodes placed on the heart. Two electrodes serve as current injection electrodes, the other two serve as voltage measurement electrodes. These electrodes are connected via lead conductors and feedthroughs to the impedance measurement circuitry inside the ULTRAsponder implant, which is enclosed in a hermetic titanium can. Several positions for the ULTRAsponder implant have been investigated. The impedance requirements have been agreed upon with the clinical experts and were sufficient to start the in vivo experiments. As a result of the ULTRAsponder project, working prototypes of both Control Unit and Transponder have been manufactured. The system shows energy transfer to the Transponder and effective power management inside the implant. Communication by backscattering modulation proves efficient, thanks to the robust demodulation and signal reconstruction. In vivo tests have been performed, which assess the functionality of the system in a real environment.